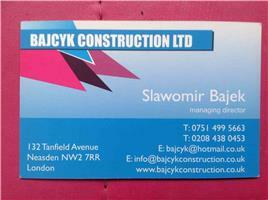 Bajcyk Construction Ltd - Builder, Kitchens based in Brent Cross, Greater London. The highest quality is our signature. Professional team, high standard of work and reasonable prices - this is our policy. Free quotation, advice, work on time - check us, happy to help.